Therese and I at Inner Sunset Sundays in 2011. Six years ago today, I struck up a conversation with Therese as we walked through the fare gates into Powell Station to wait for the N-Judah. I’d seen her there before, since we both regularly took the train after our late-night retail shifts in Union Square through the holiday shopping season. Last weekend, while waiting for the N at the same place on nearly the same day, I asked her to marry me, and she said yes. She still has the Muni transfer from the day we met (pictured right). Obviously, we’re really excited, and I wanted to share it with our readers. But I also think our story is a testament to the social connections and opportunities that are fostered by using public transit, walking, and biking. Therese and I would have never met if we commuted by car. In fact, one of the main reasons Therese and I both happened to move to SF from the Los Angeles area is because it’s a relatively easy place to live car-free. The chance for everyday social interactions while traveling is one of the greatest benefits of living in a walkable city. I’m sure you all can share countless stories of coincidental run-ins while making your way around on Muni or walking down the street. 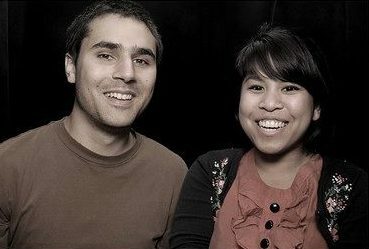 A bit more introduction: Therese and I earned our degrees together at SF State, and today she still takes the N to her office job in SoMa. (She says she would take her bike, as she has to other jobs, but getting to South Beach is a bit far and feels pretty dangerous.) We share an Inner Sunset studio with our cat George (who is actually a girl). That’s all for my little personal announcement. I also wanted to thank everyone who’s donated to keep Streetsblog going, both in our current fundraising drive and in the past few years. (And that reminds me — please give if you haven’t already!) Here’s to a bright new year ahead. This is a great story. Congrats to you both. Thank you for sharing this happy news as a public transit story! So important for us as a society to embrace these beautiful benefits and invite them into our lives more universally by supporting better and more public transit for everyone everywhere. This is the best news I’ve had in at least a month – hooray, yippee, woo hoo!!! make them more universal through better public transit. aww, congrats aaron! so cute. Congrats! 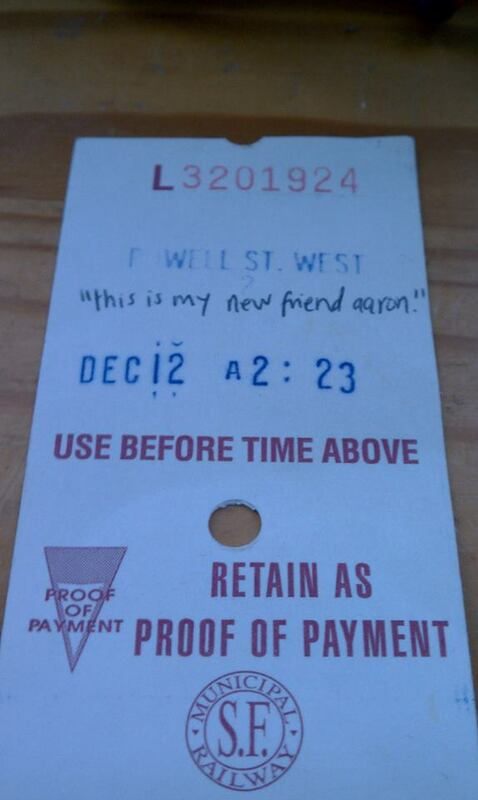 Thanks for sharing Aaron. Thanks for sharing your nice story about how transit connects people as well as places. Congratulations to you both. Thanks for a day-brightening post. May blessings attend your lives together, Historical note: My wife and I were married aboard a Pacific Electric interurban car in 1999 (but this was at a railway museum). Yeah, this is a great story on a great day. Congratulations. Many congratulations, Aaron, and a great story! Wedding on Muni too? I love this love story! Much happiness to you both. Congratulations to you two! What a wonderful story. And you make a good point about how human scaled transportation helps bring people together. Auto-to-auto communication is rare and when it occurs it is via the horn and hand gestures and usually not of a friendly nature. But on the bus, train, on foot or bike you can actually get to know people and make friends. Or more as you have experienced! Never heard a more beautiful argument for more public transportation! Congratulations, Aaron and Therese! Congratulations Aaron! She’s a catch! Wow that’s great news! Hurray for you both and hurray for the N Judah line! Definitely one of the coolest ads I’ve seen in a long time. I wonder if anyone has ever chartered a Muni streetcar for an eight-wheeled wedding chapel? Congrats! Looking forward to crashing the ceremony. Mazel Tov, Aaron!! I’m very happy for the 2 of you. Wow I’ve seen this story making its rounds on the interwebs but I never put it together that it was Aaron of StreetsBlog! Congratulations!!! !